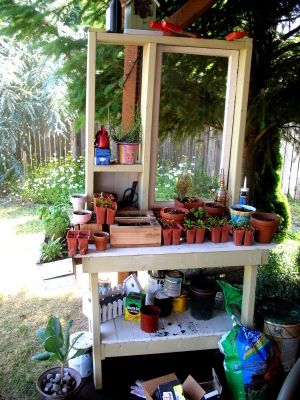 Two years ago, I built a potting bench that I never actually got around to using until this year. 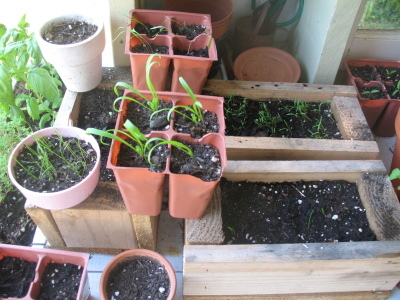 I liked having it on the back deck, but as I always planted my seeds directly in the ground, I didn't actually have much use for the potting bench, except to hold my tools. This year, I rounded up a bunch of seed pots and decided to see what I could get going on the potting bench itself, and it has apparently turned out quite well. The only problem is that I have no idea what I planted. I think I've got spinach growing... and maybe some chives... kalrobi, maybe? I don't remember. I know that it's food, though, and that none of it has any poisonous parts (like rhubarb leaves)... so I'm not worried. But it is a mystery. 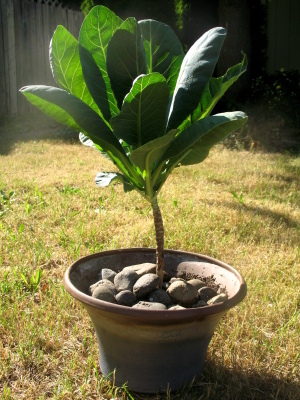 In other news, I have an ornamental broccoli cauliflower plant growing. It's not actually ornamental. Or rather, it's not an ornamental breed. It's just a regular broccoli cauliflower plant that's a couple of years old, and it keeps growing. I like it. hey Josh, the bench looks great. I've been contemplating building one for myself. I love the "ornamental broccoli." The stem looks really woody! 1. Is that MiracleGro I see? tsk. tsk. What would Jesus do???? 2. 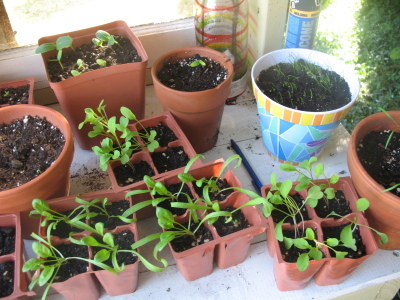 I think I might be able to identify a few of your seedlings in the first close-up picture. I think I see a cucumber seedling in the top, square container. It's poking up in the top left corner. Also, I think there's some broccoli in the bottom right cell pack. Their seedlings look like four little hands outstretched "praisin' Jesus." Miracle grow - haha... yeah, that's been sitting there for a few years. I've never used it, truth be told. Cucumber? Are you sure? I actually don't remember planting any. But maybe I did. Oops. It's ornamental cauliflower, not broccoli. My mistake. MY potting bench sure is pretty. If you go back and read the post when you made it... you even say "my wife's potting bench". Funny thing, it now looks like YOUR potting bench. :P I like the pictures after you made it... less clutter. :) I guess that's what happens when you're a plant killer. I felt pretty sure that those were cukes until you questioned. I suppose you will find out in a few weeks though. my wife, Lauren, doesn't have a green thumb either. a friend gave her a plant for a housewarming gift, which means I have another plant to take care of. the way I see it, as long as I keep a fairly close ratio of veggies to flowers (daisies, dahlias, zinnias, etc) things wont get too complicated. I like growing things and she likes to look at things. It works out. maybe there needs to be a spouses of gardeners support group. maybe there needs to be a spouses of gardeners support group. haha... that cracks me up. I actually planted some flowers for my wife, too. Of course, I have no idea what kind of flowers, because I threw away the seed pack. Oh, and I'm pretty sure that you were right about the cucumbers. I just had to think about what cucumber seeds looked like, and now I do recall planting them.